Celebrating the independent kiwi spirit of invention. By Ian Mander, 12 February 2000. Question: How do I make the water in my Super Soaker CPS 1000 or CPS 2500 last longer? Pace yourself. Use such techniques as pulling the trigger for a shorter time each shot. This will give you a greater number of shots, and with a pause in between each shot, should make the water last longer. Go for the more accurate aim. Underlined words are in the glossary at the bottom. The latest in accessories for your Super Soaker water gun! 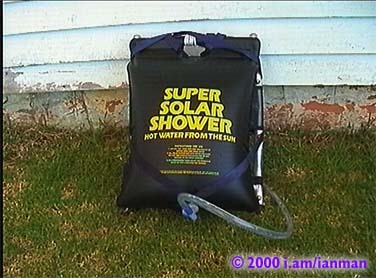 The Super Shower Backpack!! 20 extra litres of soaking fun! Works with any Super Soaker with separate pressurisation chamber! * Read and understand all instructions before attempting any modification to your own Super Soaker. 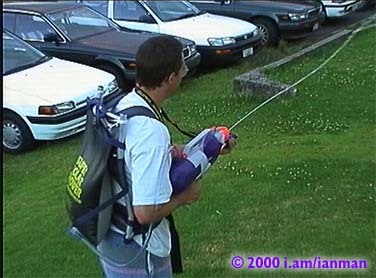 I cannot guarantee that this will work with any particular water gun, including those pictured below being used with the backpack, so any modification you do is entirely at your own risk. *Currently tested with CPS 1000 and CPS 2500. Yes, it complements them both very nicely. Super Soaker water gun (or similar) with non-pressurising water reservoir, such as a CPS 1000 (the gun I used to develop the backpack) or a CPS 2500 (which I bought after realising I now needed something to use water faster). 1 metre length of vinyl tube 11mm internal diameter (size to fit on tap of solar shower; outside diameter ~15mm). Rubber doorstop with a 30mm diameter (size to fit tightly in neck of gun water reservoir). Backpack frame or large, strong backpack (optional, but it makes carrying SO much easier). I just used my fingers to get the retaining thing out, but pliers may make the job easier. Note that this may void your Super Soaker warranty straight off. Caveat Soakeur. Remove solar shower hose from solar shower tap and replace with about 1m or so of vinyl tube. Drill center hole in rubber doorstop out to 12.5mm, no more. This hole size is based on a hose wall thickness of about 2mm. The hose needs to make a tight fit, and because the rubber is pliable, insertion of the end of the hose causes that end of the doorstop to splay out, making a tapered bung. Just the thing for jamming into the opening of the gun's water reservoir. Again, because the rubber is pliable, the 30mm diameter of the doorstop (now with a 12.5mm hole in it) fits well into the 29mm diameter opening of the water reservoir. NOTE: In battle testing I've found that the hose sometimes pops out of the doorstop. A bit of glue is needed, methinks. This is the only gluing to be done, and is really optional. The wastage itself isn't so bad – there's plenty left in the backpack, after all, and the on-board water lasts for most skirmishes – but you do wet your own feet. Securely attach solar shower to backpack frame. Place shower in a backpack with a suitable hole in the bottom (of the backpack) to feed the hose out through. Just suffer as the solar shower supplied rope cuts into your shoulders. CPS 1000. Gun pictured above and used for testing. Nozzle is rated at "5x" the volume of an XP Super Soaker. CPS 2500. A very large rifle/cannon-type Super Soaker with integrated slide-action pump (rather than a separate pump handle as the CPS 1000 pictured above) and built-in pressure guage. Three selectable nozzles, rated at 5x, 10x, and 20x. This gun is 87cm long! CPS 3000. At one stage the top-of-the-range Super Soaker. 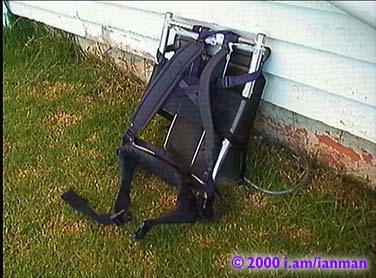 It features an 8 litre backpack which can only be coupled to the CPS 3000, although the hose can be disconnected from the gun to enable refilling team members' guns. The CPS 3000 has a (slightly) lesser range than any of its contemporaries, but without something similar to the Super Shower Backpack makes up for this with its increased capacity. Overloading. Filling up a gun's pressure chamber after filling (by pumping as normal) then topping up the water reservoir to get the maximum possible load in the gun. Tap. What non-Americans call a faucet. The photos themselves are copyright, the ideas and design aren't. Let me know how you go. Go loose! For those folk serious or crazy enough to want to make a Super Shower Backpack for themselves, take a look at the usage notes.